My biggest goals here at Homespun Devotions are to encourage you in your walk with Jesus and to say only what He wants to be said. Today, I felt led to compile a list of Biblical, practical A,B,C's that will hopefully give you a boost in your Christian journey. 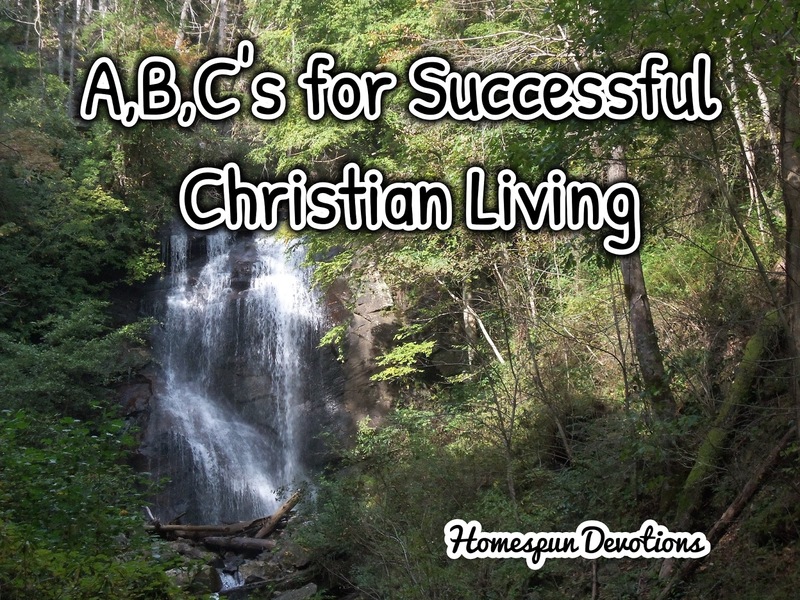 As I was writing this post, I asked Kevin and Zach the question, "What do you think are some of the most important things we need to do in order to live a successful Christian life?" They gave me some amazing answers, and I incorporated them throughout this post. There are no words to ever express the deep love and gratitude in my heart for my dear husband and son. They are, without a doubt, two of the most Godly people I know. I love them with more love than my heart could ever hold. Thank You, Jesus for answering my many prayers and blessing me with two beyond-precious people to walk through life with, and thank you, dear Kevin and Zach for your continual help, support, encouragement, and love. And, thank you, dear readers, for reading! You are such loyal, kind people, and I love and appreciate you from the bottom of my heart. Many of you have become such dear friends, and it is such a blessing to walk this Christian/blogging journey with you. If you have never reached out to let me know you read these posts, I would absolutely love to hear from you! Sometimes blogging feels like a one-way street. Encouragement is a two-way street, so why not leave me a comment today and introduce yourself? And, now for those A,B,C's, along with two accompanying Scriptures for each letter! Ask God for what you need. "Ask, and you will receive, that your joy may be full." "If ye shall ask any thing in My name, I will do it." "Let love be without hypocrisy. Abhor what is evil; cling to what is good." Cast your cares on Jesus. "Casting all your care on Him; for He cares for you." "Come unto Me, all ye that labor and are heavy laden, and I will give you rest. Take My yoke upon you, and learn of Me; for I am meek and lowly in heart: and ye shall find rest unto your souls. For My yoke is easy, and My burden is light. "Worry is a heavy burden, but a kind word always brings cheer." "But encourage one another every day, while it is called today, so that not one of you may be hardened by the deceitfulness of sin." "Brethren, I count not myself to have apprehended: but this one thing I do, forgetting those things which are behind, and reaching forth unto those things which are before, I press toward the mark for the prize of the high calling of God in Christ Jesus." "And Jesus said unto him, No man, having put his hand to the plough, and looking back, is fit for the kingdom of God." Give bountifully, freely, and wholeheartedly. "He answered and said unto them, He that hath two coats, let him impart to him that hath none; and he that hath meat, let him do likewise." Hold fast to the faith without compromise. "Therefore we ought to give the more earnest heed to the things which we have heard, lest at any time we should let them slip." Intercede, and stand in the gap for others & our nation. "I exhort therefore, that, first of all, supplications, prayers, intercessions, and giving of thanks, be made for all men; for kings, and for all that are in authority; that we may lead a quiet and peaceable life in all godliness and honesty." "And I sought for a man among them, that should make up the hedge, and stand in the gap before Me for the land, that I should not destroy it: but I found none." Jesus first, always, in all things. "If ye then be risen with Christ, seek those things which are above, where Christ sits on the right hand of God. Set your affection on things above, not on things on the earth. For ye are dead, and your life is hid with Christ in God." "Be ye kind one to another, tenderhearted, forgiving one another, even as God for Christ's sake hath forgiven you." "A man who is kind benefits himself, but a cruel man hurts himself." Laugh often—it's so good for you. "A merry heart does good like a medicine: but a broken spirit dries the bones." "He will yet fill your mouth with laughter, and your lips with shouting. Meet faithfully to worship with other Christians. "Praise the LORD! Praise God in His sanctuary; praise Him in His mighty heavens! Praise Him for His mighty deeds; praise Him according to His excellent greatness! Praise Him with trumpet sound; praise Him with lute and harp! Praise Him with tambourine and dance; praise Him with strings and pipe! Praise Him with sounding cymbals; praise Him with loud clashing cymbals! Let everything that has breath praise the LORD! Praise the LORD!" Notice your blessings and what God is doing for you. "Bless the LORD, O my soul, and forget not all His benefits." "I will bless the LORD at all times; His praise will always be on my lips." Open your heart and hands to those in need. "Whoever is kind to the poor lends to the LORD, and He will reward them for what they have done." "But whoever has this world's goods, and sees his brother have need, and shuts up his heart of compassion from him, how dwells the love of God in him?" Quit doing the things Jesus wouldn't. "Be ye therefore followers of God, as dear children; and walk in love, as Christ also hath loved us, and hath given Himself for us an offering and a sacrifice to God for a sweet smelling savor." "Study to show yourself approved to God, a workman that needs not to be ashamed, rightly dividing the Word of truth." "For by your words you shall be justified, and by your words you shall be condemned." Trust God with all your heart for all things. "Trust in the LORD with all your heart; and lean not to your own understanding." "I appeal to you, brothers, by the name of our Lord Jesus Christ, that all of you agree, and that there be no divisions among you, but that you be united in the same mind and the same judgment." Volunteer your time, gifts, and full availability to God. "Hereby perceive we the love of God, because He laid down His life for us: and we ought to lay down our lives for the brethren." "Wait on the LORD: be of good courage, and He shall strengthen thine heart: wait, I say, on the LORD." "Rest in the LORD, and wait patiently for Him: fret not thyself because of him who prospers in his way, because of the man who brings wicked devices to pass. For evildoers shall be cut off: but those that wait upon the LORD, they shall inherit the earth." Xerxes, the King, required that no one enter his throne room without an invitation. The great news is God has already extended a perpetual invitation to His throne to us! "All that the Father giveth me shall come to Me; and him that cometh to Me I will in no wise cast out." Yield to God's will in every part of your life. Zeal is important. Keep it alive. "Do not let your zeal subside; keep your spiritual fervor, serving the Lord." We are celebrating my dear husband's birthday, and I wanted to share what I made for him. We talked about getting a Dairy Queen ice cream cake, like Zach chose for his birthday back in December. Then we talked about me making him a huge, homemade-from-scratch chocolate chip cookie. I've been so sick for several weeks, and I am not able to do much without having to sit down every few minutes, so my kind, thoughtful, ever-concerned husband decided he didn't want me to attempt something totally from scratch. SO, he mentioned that he would like cupcakes made from a cake mix, so we decided on that. I wanted to add my own something special to them, so this is what I did. I started with this store-bought cake mix and store-bought icing. Helpful hint😀 I always add 2 Tbsp. of mayonnaise to store-bought cake mixes to make them more moist. and I placed some on top of each cupcake. Then, I put a Hershey's chocolate kiss in the middle of each one. In the background, on the left, you can see the most adorable coffee pod display case my sweet niece, Kristen, sent to us for Christmas. Is this the cutest, neatest thing you have ever seen? To take the photo below, I temporarily moved it over beside the corner shelf my dear Daddy made for Kevin and me years ago. We display our collection of white pitchers on it. I love the simplicity of a white pitcher sitting on a white doily! Stephanie's Ornament Exchange in December. I just LOVE it! I felt so bad that I didn't get to do a special post to link with Stephanie's Reveal Party, but we were gone for several weeks and weren't home for me to open the package and take pictures. Here's a picture of everything that was in the box. Aren't these primitive Christmas ornaments so charming? In closing, I am including a few songs that are encouraging us right now. I hope they do the same for you! I don't know what you are going through, but everybody's going through something. This life is full of trials and tribulation, just like Jesus said. Whatever you are going through, remember this. Everything is better with Jesus. I just want to remind you that He is going through your pain WITH you. He will never leave you, and He is always on your side. It is safe to put your trust in Him. Maybe you've prayed for many years over something, only to find that your situation hasn't changed at all. Keep trusting for your breakthrough. Maybe you just haven't seen it yet. God has never failed us yet. We've seen Him move mountains SO many times, and I believe we'll see Him do it again! The God of the hills and valleys is with you, my friend. Through all of life's changes, He remains steadfast, faithful, and the same. Keep putting one foot in front of the other, and keep moving forward. God isn't finished with you yet. You still have work to do. Hold on. Lift up your head. He'll get you through this. Lastly, the song below is the cry of my inmost soul. God bless each one of you, and may His presence be especially near to you in this very moment. Wow, Cheryl, coming up with the A, B, Cs of living the Christian life was a lot of work, but I'm sure it was a labor of love for you. Thanks for the inspirational reminders today. Yes, I surely love delving into the Word of God, and this post was a pleasure. God bless you abundantly, my friend! Happy birthday to your husband! He shares his day with my 15 year old daughter, Natalie. I'm heading to Trader Joe's soon for their cake mix which is amazing (tastes like homemade!). She says she wanted cupcakes for her birthday instead of cake. Funny, right? And as I've actually been pretty sick for the past few days a cake mix is perfect! Blessings to you and your family today!!! Oh, thank you so much for the happy birthday greetings to Kevin! Happy Birthday to Natalie, too! I am so sorry to hear that you have been so sick and trust the Lord has touched you by now. That is something how we had so many similarities with the birthdays, both of them wanting cupcakes, and both of us being sick! Thank you so much for your sweet words, and that would be nice to have them done in artwork. Unfortunately, I am pretty art-challenged! LOL! I could probably come up with something if I really had time to devote to it. But, it was such a nice and kind thought on your part! Many blessings to you and your family, too, Sue! GREAT indeed Cheryl to walk in the Light of His word. We all need to learn our ABCs its good to be reminded. I agree re blogging being lonely at times so yes encouragement that the words are read is a blessing indeed. Hugs in prayer dear sis. Thank you so much for your kind comment, Shaz! Sending hugs back to you and hopes for a wonderful week ahead, my friend! Such an encouraging post, Cheryl! I love your A, B, C's! Your cupcakes are amazing! What a great idea of making them extra special! I also love your k-cup holder and all your special gifts. What a blessing! I hope you're feeling better and I'm praying for you, my friend. Thank you ever so much, my friend. You will never know how much I appreciate your faithful friendship and prayers and support. I got your sweet email and will write you back soon. Sending much love and gratitude your way today and trusting you are feeling well! This was an absolutely amazing post! When you mentioned commenting in this post, it convicted me. How many times do I read one of your beautiful posts or listen to a song by incredible artists like Danny Gokey or Unspoken and never stop and spend a few seconds to write a comment and relate how blessed I was by them! I absolutely LOVE every one of these A,B,C,s. I just pray I can live by them! And coming from someone who had the pleasure of experiencing them, (quickly devouring them whole) I can tell you that these sweet treats are AMAZING. Thanks for all you do for us, even when you're feeling so rough. I'm so grateful for you! God Bless you abundantly! Oh, dear Zach! You melt your mama's heart time after time. You are so much more precious to me than I could ever put into words, and I thank God from the bottom of my heart for you. Love you with more love than my heart could ever hold, and God bless you abundantly too and always, dear son! First of all, Cheryl, I loved reading about your gratefulness in God providing Kevin and Zach in your life. That was so beautiful! 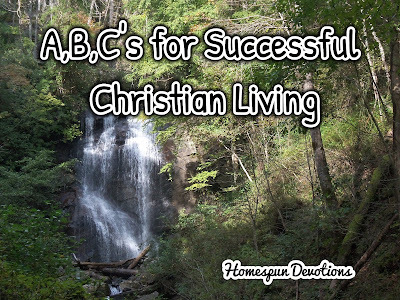 I also loved reading your ABC's for successful Christian living. What wonderful thoughts and wisdom you've shared with us. I'd like to add one more on the Don't Worry: Luke 12:25 "And which of you by being anxious can add a single hour to his span of life?" This is sooooo hard sometimes to do, but the message is so true! The cupcakes looked so tasty and your shelf with the white pitchers and doilies looked so pretty. Your gifts from the exchange were just lovely and so special. God Bless You, my friend! Dear Kitty, thank you so much for adding that precious verse. That is so hard to do, but you are so right, the message is so true. Thank you for your kind, sweet words and for always being such a faithful supporter and blessing to me. Many blessings back to you and much love! Thank you so very much for your gathering here of beautiful Scriptures, words, and songs! I shared one of those songs with friends who are in a difficult season, and they were so blessed. And what a great gift to share these thoughts that your husband and son joined in with also. Truly God is so good to allow us to encourage each other within our own families. I am praying still, for you and your family--I have appreciated your dear prayers so much! You are a precious friend and inspiration. Hugs and love to you! Oh, Bettie! That just touched my heart so much to know your friend was blessed, and I am SO grateful for your steadfast encouragement and support and kind words. Your prayers are appreciated more than I could ever express, and I continue to pray for you, too, dear friend. You are a precious friend to me, too, and I thank God for you. Many hugs and much love back to you today with hope that you are feeling better. Thank you so much for your precious words, dear Betsy! And thank you for the birthday greetings for Kevin! You are so welcome for the card, and I do trust you had a wonderful birthday, my friend. Thank you ever so much for your many prayers for my family and me, and I want you to know that I continue to pray for you, too. I so hope you are feeling better and send many hugs and blessings and much love back to you today! Such a beautifully written post Cheryl, how much love and devotion to the Word you shared as you took beautiful scriptures and shared deep truths from the Word about how to live for the Lord! Truly a list to print out, hold onto and turn to! Such beautiful music you have shared here too, so many encouraging songs to lift up the heart to continue on pressing into Jesus! How wonderful to be in His presence, and to feel His sweet spirit flood into our soul... we are so blessed to know Him, and the last song is my cry too, I'm listening to it as I type this message.. just give me Jesus! He is all we need! Love you sweet friend, and am so thankful for your heart of love for the Lord, and for the beautiful messages HE gives you to share here :) Blessings and hugs across the miles! Hi Sweet Friend! I just LOVE my visits here! I'm not as quick to get here, but I always make sure I eventually do. Life is just soo hectic here of late. But God... He knew I needed to see this post EXACTLY tonight and EXACTLY at this moment. I had just finished walking around inside my house talking to God and meditating on what He had showed me this afternoon. The very first verse you shared above, John 16:24, lept off the page at me and caused me to exclaim and brought a huge smile to my face. It illuminated further what the Lord was showing me this afternoon! Your faithfulness to share encouragement from God's Word ALWAYS ministers to me in profound ways. I'm so sorry to hear you have been sick. I will be lifting you up to the Great Physician. Those cupcakes looked AMAZING! Well done!